Suja Juice is a true juice with no garbage added. One of these per day should be very beneficial, but we’re not into overdoing it… either way, if Suja can make celery and kale taste remotely decent, that’s impressive. Juicing has always been looked at as a way to help picky eaters consume more fruits and vegetables to get in their daily 5-7 servings on the life enhancing food. But, it wasn’t until fitness icon Jack LaLanne endorsed the Power Juicer in the early 2000s that it really began to take a foothold with the average Joe. Part of the allure of juicing is that its proponents tout its ability to “heal” the body by “cleansing” it of toxins. This started a craze known as juicing “cleanses” where people essentially consume nothing but a variety of juiced fruit and vegetable drinks several times a day for 3-5 days with no other foods. However, not everyone wants to drop $500-700 for a quality juicer which inevitably led companies to start selling high quality juices to capitalize on the expanding niche of the health and fitness market. One company that’s recently been trending a lot with the masses is Suja Juice. They’ve created a rather extensive line of high-quality, cold-pressed juices that have been the talk of the town. As you can see from the prices above, these are not always cheap juices to buy online. You can sign up for price drop alerts, but it might be best to get these at a local store like Whole Foods or Sprouts, if they carry them. Suja Juice may be all-natural, but it’s void of protein and fiber, both of which are critical for health! as the basis for their diverse line of beverages. 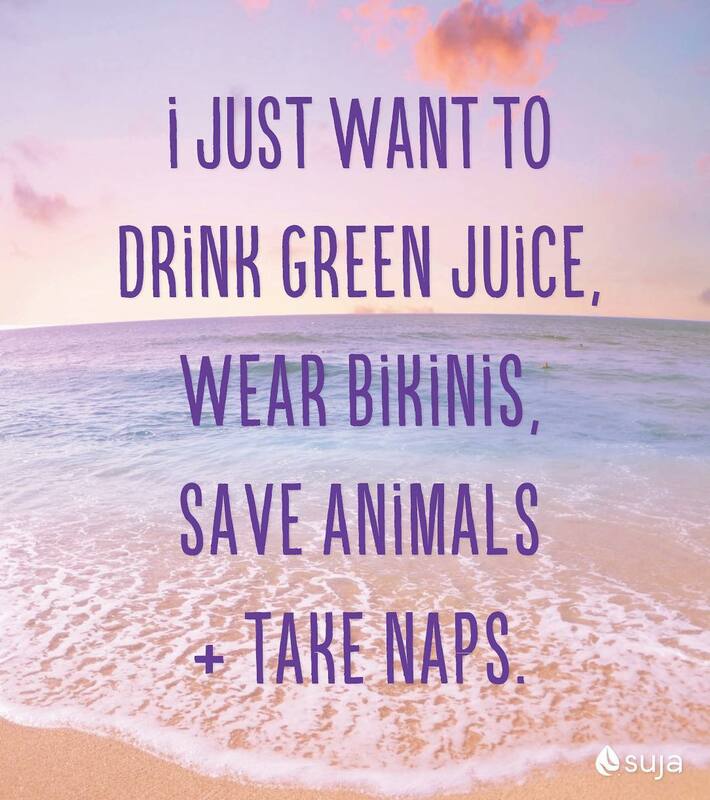 Additionally, all of these juices and probiotic drinks are free of any chemicals, fillers, gluten, preservatives, or other “junk” that you’d typically find in the mass market juices out there in your local grocery store. This alone makes them heads and tails better than most of the juice products you’ll see on the shelf, but with it also comes a heftier price, as one would expect. Think of any fruit, vegetable, or other “superfood” you’ve heard about and you’ll no doubt find it in one of the multitude of juices from Suja. You’ll come across more common produce such as apples and celery, but you’ll also come across some of the trendier, more “exotic” fare, such as Chlorella, Spirulina, and even collard greens! All of these ingredients are great in their own right, and provide numerous benefits from a micronutrient, vitamin, and mineral standpoint, but when you juice them, all of the fiber is removed, and you’re left with a drink that is 98% carbs and sugar with only miniscule amounts of protein and fiber. Just take a look at a few of the nutrition labels we’ve displayed here if you don’t believe us. Another great thing is that thanks to the delicious fruits and vegetables used, no added sweeteners are required – especially not artificial ones like sucralose, aspartame, or acesulfame potassium (Ace-K)! A couple of their drink flavors, such as Lemon Love, do contain added stevia, the natural sweetener. We’ve noticed that stevia is getting better each and every year, with manufacturers slowly removing the bitter notes of this bittersweet leaf! Suja is a “functional beverage” company that specializes in organic, non-GMO, cold-pressured juices to enhance health and vitality. But are their drinks all hype? Unfortunately, without the whole entirety of the food, especially the fiber, we’re not sure if the greatest benefits of eating fruits and vegetables fully extend to juice. Undoubtedly, we believe that you’re definitely better served in health and wealth by eating your fruits and veggies in whole food form, as research has shown that eating 4-5 servings of fruits or vegetables per day will help you live longer (due to less cardiovascular disease). However, that doesn’t mean there’s zero benefits — clearly juice is far better than other beverages — we just don’t think it’s as good as whole fruits, due to the lack of fiber and whatever else may have been lost. Whereas we have magnitudes of research on fruit and vegetable eating (see the link above), we have far less in terms of juicing. Don’t let this skew your diet away from protein and healthy fats too much though! 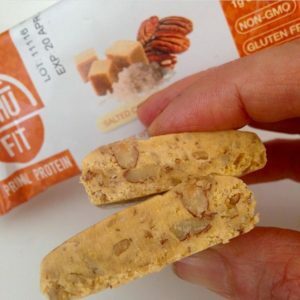 Bhu Fit Bars come in primal, vegan, and paleo varieties and should help on the other end of the macronutrient spectrum (fats and proteins) for juice fans! Meanwhile, from a macronutrient basis, adding too many foods that are pure carb and free of protein and fiber may throw off a well-planned diet. Anytime you eat and avoid protein, you inherently lessen your chances of hitting your optimal daily protein intake number, which could have bad effects on your muscle tone and overall body composition. [4,5,6] So get that protein in elsewhere during your day — and if you want a protein bar that’s as natural as Suja Juice is, then Bhu Fit Bars might be right up your alley. Otherwise, Suja Juices will obviously work best for low-fat dieters, seeing that they’re primarily carbohydrates. Of course, all good things have to get taken too far by the “obsessives” out there. No doubt you’ve all heard of people, or maybe you yourself have done a “juice cleanse”. Well, this is Suja’s version of it. As a “functional beverage” company predominantly manufacturing non-GMO organic juices and probiotic beverages, it only makes sense that Suja would have its own version of a cleanse referred to its fans as a Suja cleanse. In general, Suja users using the various juices for a 3-5 day juice cleanse drink upwards of 6 bottles per day of Suja Juice with no other foods during the day. We won’t get into the full reasons why this is absurd and not good for general health, but our main problem is that it’s never a good idea to reduce your protein and healthy fat consumption to such levels. While we’re happy to see people have a juice, we’re not on board with such cleanses. Suja Juice has been around for a few years and there’s plenty of reviews out there on the existing products. So, how do they taste with the masses and why are they so popular? Overall, people consuming Suja Juice describe it as sweet, fruity and fresh-tasting. 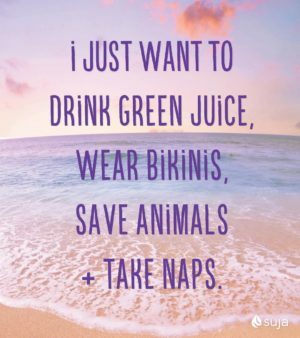 This even goes for some of the more exotic juices Suja makes that contain beets, spinach, kale, and even collard greens! Best of all, reviewers don’t say they taste like pureed grass clippings, but describe them as “earthy” and “full-bodied.” This is clearly a step up from other “smoothies” and “juices” that are a struggle to finish. With a strong foothold on the juicing crowd already in place, Suja has set its next target demographic as those that have embraced drinking vinegars to accelerate weight loss. Their next product is a line of Drinking Vinegars. 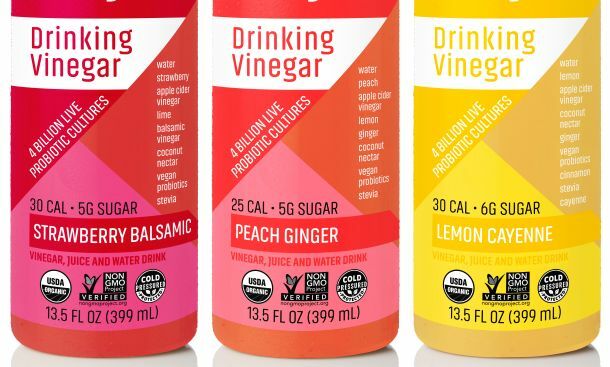 Suja is looking to expand its line of “functional beverages” with Drinking Vinegar which looks to capitalize on the Cider Vinegar diet fad. If Suja can even make juices with celery and kale taste remotely palatable, chances are they’ll be able to make a cider vinegar beverage taste pretty decent, but time will tell soon enough! Drinking Vinegars are next for Suja… but where’s the protein?! The “Suja Cleanse” will more or less have its 15 minutes of fame and then fade into oblivion like the rest of these temporary trends. No scientific studies or evidence has been down or concluded that “cleansing” by any sort of means (juicing, detoxing with various teas, etc) has any proven benefits on the body. But aside from that, we’re thinking that this is good for someone who’s not getting enough fruits or vegetables in, and could pair well with a meal plan such as Rich Piana’s 5% Nutrition Meal Plan, which we’re absolutely loving so far but needs a bit more fruit and veggie support. If you enjoy drinking juices that’s all fine and dandy, but don’t make the mistake of thinking they are inherently healthier than eating whole fruits and vegetables, or that you are “purifying” your insides. Your liver, spleen, kidneys, etc. already do a damn good job of it. But as a supplement here and there, sure, we’ll take a juice, and Suja looks like one of the best out there. 3 Comments | Posted in Food, Supplement News | Tagged Carbohydrates, Fruit, Juicing, Natural Sweeteners, Stevia, Suja, Vegetables.